As a little girl in 1940, Jane Janz loved the Laguna Beach Library across the street from her grandparents’ house at 289 Laguna Avenue. She fondly recalls the comfy oak chairs in the children’s library, the card catalogue and the sound made by the check-out machine when Mrs. Case, the librarian, punched her card. Over five decades later in 1993, she became a frequent library user once again while researching a Laguna Beach copper manufacturer, Craftsman Studios, that produced a teapot she’d picked up at an estate sale in Fullerton. She had no idea that the research would lead to a book. In “Naming Laguna Beach,” released in June, Janz shares her wealth of knowledge about the evolution and naming of the town of Laguna Beach, cleverly framed by the progression of the ever-expanding postal service. “It’s all about the triangle,” Janz said, referring to a section of land that encompasses what is now Laguna but was not included in any Mexican land grants issued back in 1824. Such areas were called “no grant” land and became government property and left off maps of the day. By the mid 1800s, the government began to survey their holdings, including that triangle. The surveys coincided with the Homestead Act of 1863 aimed to get development underway by putting land into the hands of private parties. After a friend suggested there might be some information about the copper company in back issues of the local papers, Janz was introduced to the microfilm reader in the library where the copies of old newspaper were stored. Reading those papers became her new hobby. “I was hooked,” she said. Janz quickly found herself repeatedly dropping 15 cents into the machine to print any and all pages that piqued her curiosity. From a short-lived postal station in Arch Beach established in the late 1800s, to the post office, grocery store and livery stable run by her grandfather, Nick Isch—whose front porch became the social hub of Laguna’s downtown by 1895—Janz chronicles the history of the town’s development. Thirty-seven homesteaders claimed land in three distinct townships—Laguna, Arch Beach and Aliso. Since going through Laguna Canyon was the only way to reach Laguna Beach, Los Angeles Times articles in the 1880s referenced the town as “the beach at Laguna Canyon.” The locals called the town Laguna Beach, and subdivision maps were labeled likewise, Janz said. Plat maps of the township of Arch Beach, the first to get a post office in 1889, delineated a stretch from Cleo Street to Calliope Street and later extended the boundaries from Bluebird Canyon to Nyes Place. Over the next five years, four postmasters presided until the station was eventually closed in 1894. In 1891, a post office was opened in the then-separate town of Laguna Beach. However, Janz’s sleuthing revealed that the Post Office Department, not allowing duplication of names, wrote “Lagona Beach” atop the petition form because a city in San Diego county named Laguna had already been granted a post office using the name Laguna in 1889. Thus, the postal department considered the name taken. An attempt to remedy the misnomer in 1894 resulted in “Beach” being dropped due to an order from the Post Office Department stating that only one-word names would be accepted. Regardless, the town’s people continued to use the name Laguna Beach. In addition to saving and referencing the old copies of Laguna Life (published by Elmer Robbins beginning in 1915) and its successor, the South Coast News, Janz credits close to 20 books, published between 1890 and 2006 by various authors, as sources. 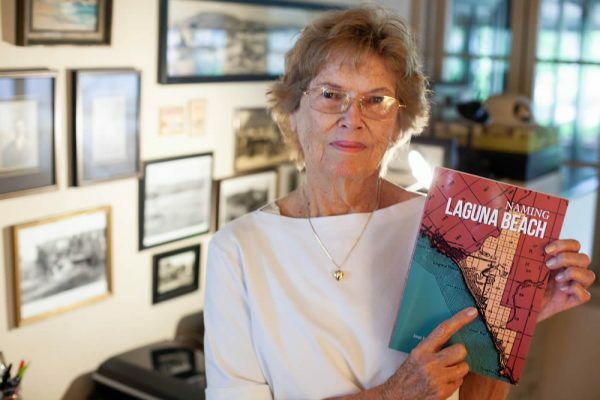 She also re-tells the stories of longtime friends, including Ervin Watkins, Ed Covern and others, who were all happy to share their memories of old Laguna. The book’s revelations are complemented by a unique collection of vintage images not seen in prior publications. Janz had heard the names of prominent families while growing up in Bluebird Canyon, but it wasn’t until she and her mother visited her grandfather and dug into a trunk of old photos at his Leisure World home, that she started to label the photos and put faces to the names she’d heard her whole life. Janz’s motto, “Do it whole hog or not at all,” has resulted in a book of painstakingly fact-checked details of Laguna life, from the progression of mail delivery by stagecoach, to transport of mail and people by “auto stages” and the myriad postmasters and office locations, to the buildings where Hollywood films were shot. 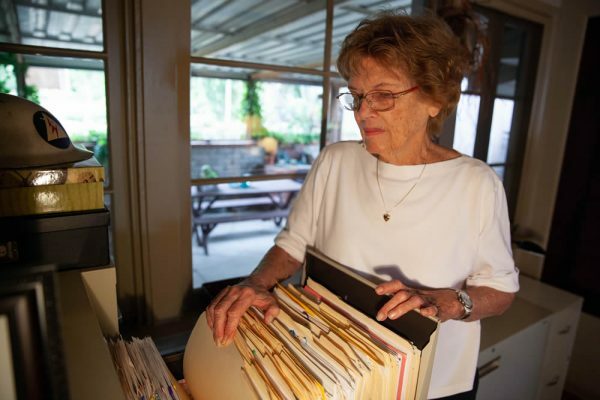 Her work ethic has also netted too many filing cabinets to count in her home, filled with stories, photos and articles which could always show up in another book, maybe even one about that mysterious teapot. “Naming Laguna Beach” is available for purchase at Laguna Beach Books, 1200 S. Coast Highway.